"Farmer Abu Hassan Ahmad was so attached to his home; he decided to take the whole house with him when he had to move. 'We had lived in the old site for more than 20 years, but now we want to be closer to my mother-in –law to take care of her' "
"The 56 year old farmer said several village elders got about 150 villagers to help with the ‘big move”. Besides helping to carry the house half a kilometer to the new site, the villagers also took part in a “gotong-royong” (communal working together) to clear the land at the new location. 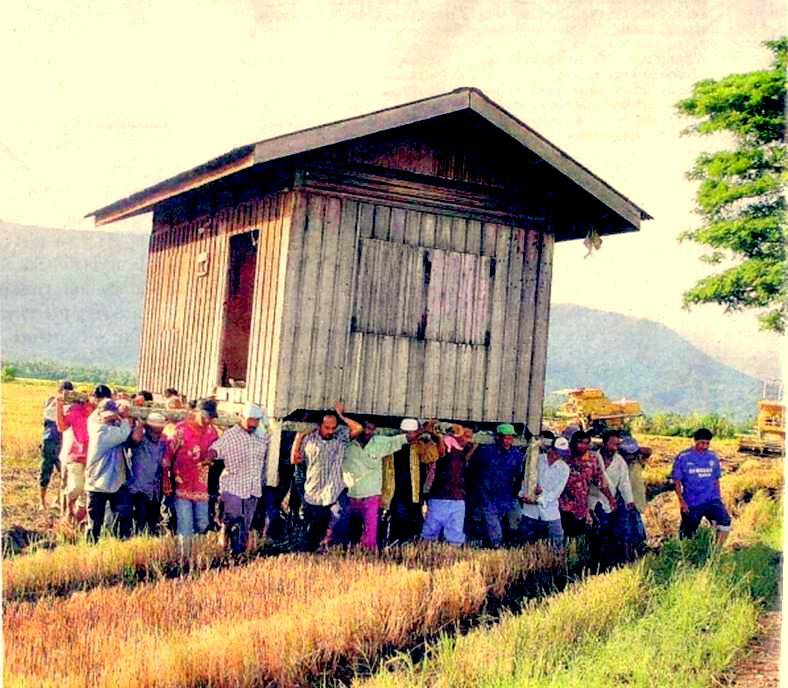 It took an hour to move the house." This article highlights how people traditionally decided how they would keep their family "together" by building their homes or maintaining their homes "around their families." It is very relevant today. Today's modern designs are totally opposed to this concept and tends to isolate family members. Also, ultimately people un-learn the social skills necessary to get along in a family. Yes Roberto, this is is the case not only in Malaysia, but all over the world. In rural pre-industrial societies, communal cooperation is strong. But in big towns, such traditional relationships often break down. A lot of my work is aimed at creating conditions for strong neighbourhood communities to form in dense urban settings. http://www.announcements-shoppe.com/Moving-Announcements-Moving-Cards/productsList-11-1.htm. I also wanted to order invitations for our housewarming party so all these sites had excellent ones. I ended up buying my moving announcements cards and housewarming invitations from http://www.CardsShoppe.com and was very pleased. Both personalized cards turned out great! It's best to scram [URL=http://yaadxxp.makesboyscrazy.com/clogged-pores-on-my-back.html]clogged pores on my back[/URL] Windows XP and just upgrade your laptop. It's much better. [URL=http://lbqaqou.makesboyscrazy.com/pam-olsen-chehalis-wa.html]pam olsen chehalis wa[/URL] In addition, Windows XP is scheme [URL=http://dwzagoj.makesboyscrazy.com/felt-book-tachibana.html]felt book tachibana[/URL] more advisedly then Windows Me. Windows Me is unused and multifarious programs that can run with XP, can't [URL=http://tjjijoe.makesgirlscrazy.com/tenchi-muyo-uncut.html]tenchi muyo uncut[/URL] run with Me. Amazing ! It is lovely idea of moving home from one place to another place. I never thought like that. How do you make it possible. have you booked any moving company for it ? I am quite interested in it .